The danger posed by rising levels of atmospheric carbon dioxide has seen many schemes proposed to remove a proportion it from the air. Rather than simply capture this greenhouse gas and bury it in the ground, though, many experiments have managed to transform CO2 into useful things like carbon nanofibers or even fuels, such as diesel. Unfortunately, the over-arching problem with many of these conversions is the particularly high operating temperatures that require almost counterproductive amounts of energy to produce relatively low yields of fuel. Now researchers at the University of Southern California (USC) claim to have devised a way to take CO2 directly from the air and convert it into methanol using much lower temperatures and in a correspondingly simpler way. With the simplest structure of all alcohols, methanol can be used directly as a clean-burning fuel for appropriately modified internal combustion engines, as well as in fuel cells. It is also a very useful material for the production of other chemicals such as formaldehyde, from which such things as plastics, explosives, and paints can be made, along with transformation into dimethyl ether (a replacement for hydrocarbons in aerosols propellants), acetic acid, and a range of solvents, anti-freezes, and de-naturing agents. To produce methanol from CO2 in the air, the researchers at USC's Dornsife College of Letters, Arts and Sciences first bubbled captured air through an aqueous solution of pentaethylenehexamine (PEHA), an ammonia-derived organic compound with multiple amino groups that – at raised temperatures – helps form chemical derivatives from alcohols. 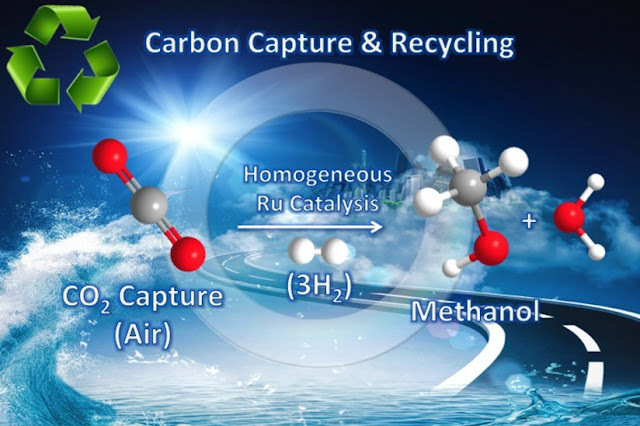 They then added a catalyst made from ruthenium (a member of the platinum group) to promote hydrogen attachment to the CO2 when the mixture was subject to high pressure. The solution was then heated to around 125° to 165° C (257° to 359° F), and around 79 percent of the CO2 was converted into methanol. Though the resulting methanol was still mixed with water as it was produced, the researchers state that it can be easily separated using simple distillation processes. In addition, with the new method operating at such comparatively low temperatures, minimum decomposition of the catalyst meant that the researchers were able to repeat the process five times with minimal loss of the catalyst effectiveness. It also uses a homogeneous catalyst (that is, a soluble catalyst in solution with the chemicals it is reacting with) resulting in a simpler and faster "one-pot" process. Though the method is still in its infancy, the researchers are looking at ways to refine the process so that it could be scaled up to industrial levels, but they admit that such a system may be five to 10 years away and will probably be still more expensive than ordinary fuel production. "Of course it won't compete with oil today, at around $30 per barrel," said Professor G.K. Prakash from USC's Department of Chemistry. "But right now we burn fossilized sunshine. We will run out of oil and gas, but the sun will be there for another five billion years. So we need to be better at taking advantage of it as a resource." G.K. Prakash collaborated with George Olah and graduate student Jotheeswari Kothandaraman and senior research associates Alain Goeppert and Miklos Czaun of USC Dornsife. The research was recently published in the Journal of the American Chemical Society .